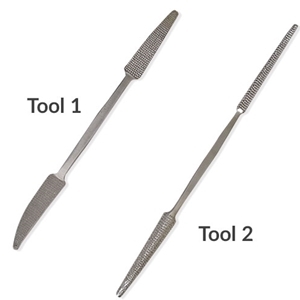 This imported rasp set includes two (2) large long lasting rasps made from stainless steel. Each of the two rasps have dual specialty purpose rasping ends each uniquely shaped. Both ends of Tool 1 are knife-shaped. One is flat, the other has a bit of a curve to it. Ideal for crevice and general cutting work. The approximate length of Tool 1 is: 10 1/2". The ends of Tool 2 include a rat tail end perfect for circular rasping and a half-round spear. The approximate length of Tool 2 is: 12". These rasps are impervious to rusting and staining. Their rectangular handles allow easy gripping.